In the very serious world of business technology and enterprise networking, is there ever a time and a place for fun and games? Cisco Systems believes that time has come, and they want you and I to join in and play along with them. Cisco has apparently found a new way to make routers fun -- yes, I really do mean entertaining. 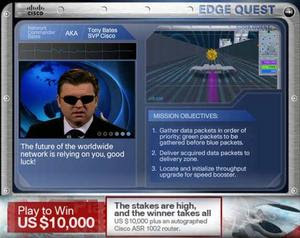 Bloggers like Brian Boyko previously shared their perspective on the initial Cisco EDGE QUEST game launch. And now Paul Young has written a commentary about the recently launched tournament of aces that offers a $10,000 prize to the winner. Cisco's Doug Webster says "Our intent with this game is to find new ways to engage with our customers and to have fun in the process." Will the company's newfound embrace of digital marketing practices change people's perspectives about the world's leading networking equipment provider. I think it will. "We've become a society where video and web 2.0 collaboration applications are shaping virtually all of that network experiences that we use throughout our daily lives," said Webster. "What we are attempting to do with Cisco EDGE QUEST is to showcase innovative Cisco technologies like the ASR series that are enabling those Connected Life experiences." Additional details are available on the CiscoSP360 channel at YouTube. My regular readers may recall that I've written commentaries before about Cisco -- some may remember my Entry for the Cisco Connected Life Contest. Frankly, I was surprised when Cisco featured my commentary entitled Re-Imagine Cisco: the Human Network Voice on their campaign microsite. One might say that Cisco's creativity caught my attention, and apparently that appreciation was mutual. Therefore, I've decided to go work for Cisco and participate in helping them to accomplish several key digital marketing goals. I'll be working closely with their Service Provider marketing team, specifically on evolving the Cisco Powered program. Together we'll be launching a new, Cisco-Sponsored, blog called the Business Technology Roundtable. In the coming weeks I'll be sharing more details on this exciting new adventure, as we attempt to remove the mystery of managed services -- within both the enterprise and SMB application environments. And, for those who still wonder "what are managed services?" -- we'll be featuring some insightful business technology alignment success stories; described by the people who have actually been there, and done that. Business Technology as a Service has arrived.